DAYTONA BEACH, Fla. (April 21, 2017) – The ATF & Gunslinger team will return to the Goodwood Festival of Speed in West Sussex, England, June 29-July 2, 2017. With a stable of three trucks and four all-star drivers, the team will look to once again return to the Winner’s Circle in the 25th anniversary of the iconic motorsports event. NASCAR Camping World Truck Series champion Mike Skinner will return to his No. 5 Cessna Toyota Tundra dubbed the “Skinner Special” for the 25th annual Goodwood Festival of Speed. Now a three-time defending winner of the NASCAR Class, Skinner has set his sights on posting a sub-50-second run up the 1.16-mile hill climb and placing inside the top-five of the event’s overall finishers. With the Festival of Speed showcasing cars of all generations and specialties, Skinner will have to overcome fierce competition from a class of four-wheel drive, Pikes Peak-style hill climb machines to achieve his goals for the 2017 event. Professional athlete, actor and automobile aficionado Bill Goldberg will be behind the wheel of the celebrity truck and join the team during his first appearance at the renowned motorsports event. Goldberg is known for being a fierce competitor in the ring with two World Championships, a WWE World Heavyweight Championship, a WCW World Heavyweight Championship and a WCW World Tag Team Championship. However, a chainsaw proved to be his fiercest competitor last year. With Goldberg slated to appear at the 2016 Goodwood Festival of Speed, he was forced to withdraw after the chainsaw was declared the winner between a battle of saw versus leg. 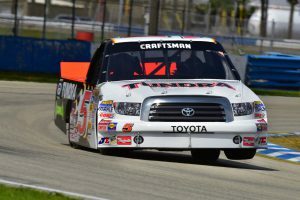 Team owner Andrew Franzone will make his fifth appearance at the Festival driving one of Toyota’s most historic trucks—historic Truck 10—a 2004 vintage Toyota Tundra that is responsible for Toyota’s first win in NASCAR. In this event, the ATF & Gunslinger group not only aligns on their passion for motorsports and competition, but also on supporting our military. The group will race to help raise awareness and funds for Hope For The Warriors, a national nonprofit that’s dedicated to restoring self, family and hope to post-9/11 service members, veterans and military families. Additionally, the team’s drivers and trucks will incorporate the Hope For The Warriors logos on both their fire suits and race trucks. Hosted by Lord March at the Goodwood Estate in West Sussex, England, the Goodwood Festival of Speed features every kind of car imaginable from the 1800s through today, while also attracting some of the most accomplished drivers in motorsports. Celebrating its 25th anniversary, this year’s Festival of Speed will take place June 29-July 2. Follow @MStheGunslinger on Twitter, or @SkinnerRoundUp on Twitter, Facebook or Instagram for the latest news and updates about Skinner’s on- and off-track activities.